Going home for the weekend always has the bonus of being able to fish the Caney and this last weekend was no exception. I didn't get as much time as usual due to other obligations but it was still a great opportunity to be on the water. 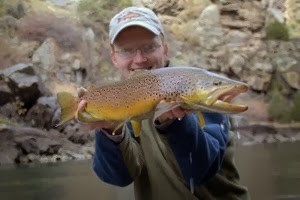 I headed down Sunday morning and arrived on the river around 11:00. The first thing I noticed was that the fish were feeding heavily on or very near the surface. The surface of the river was covered with small midges and the fish were having a feast. The cold temperatures (air temperature in the 20's) made it difficult for the bugs to get off the surface once they hatched and the fish were taking advantage of the banquet presented to them. The fact that the fish were feeding high in the water column was exciting because I had done something that I've never done before; tie on flies at home (where it was warm of course) and I had gambled on a midge hatch where Zebra Midges would work well. The fish approved and I was soon catching fish after fish. There were several large fish cruising and making quite a ruckus every time they broke the surface in their pursuit of the tiny bugs. The funny thing was, I had probably 6-7 fish that I thought were large when I first set the hook. 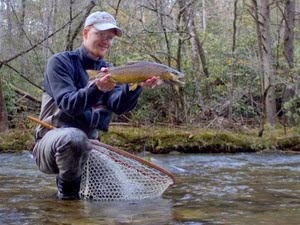 Caney Fork fish seem to pull as hard or harder than any other trout I've ever fished for and yesterday they were in fine form. 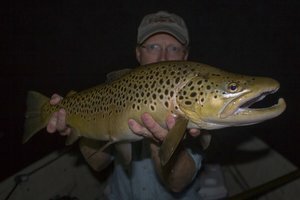 Several fish were landed in the 14-15 inch range and each time I was ready to proclaim that I had a bruiser on before I actually saw them. 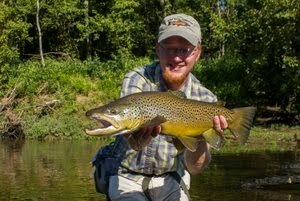 The one brown I landed I honestly thought was at LEAST 18 inches. Despite the fact that none of the fish turned out to be more than 15 inches (or maybe 16 if I stretched them out a little), it was still a great day on the water. I even learned a few things. Later on I'll share some more of the cold weather wisdom I gained, but most importantly you should know that your reel WILL freeze up every time you hook an especially hard-fighting fish (this is actually a corollary to Murphy's Law). Also, your guides will generally be completely iced up just about the time a fish takes the fly (again closely related to Murphy's Law). 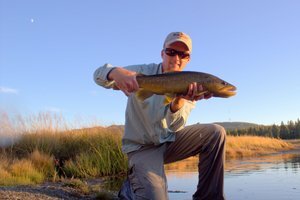 Despite these minor annoyances, it IS possible to fish in cold weather and have a good time and even stay warm in the process.